faith – ImpactU: Social, Economic and Political YOU! I took this photo tonight when I went to take advantage of Hobby Lobby‘s 40% off sale on their stamps. I spent $40 bucks on some awesome stamps, mostly Christian. I got home and noticed that I received a response regarding the photo you see here on my Facebook. It wasn’t bad, just their opinion that Hobby Lobby is “suing the federal government so they don’t have to do things like provide equitable health insurance coverage for their workers” and that the sign in the company’s entrance was merely a “window dressing”. That sign has been up there since I have been patronizing the store. I just took a photo of it because I thought it was cute. Who would have thought it would turn into a blog entry? Also, i understand that Hobby Lobby isn’t alone in suing the Obama administration over this mandate (new health care law by President Barack Obama). 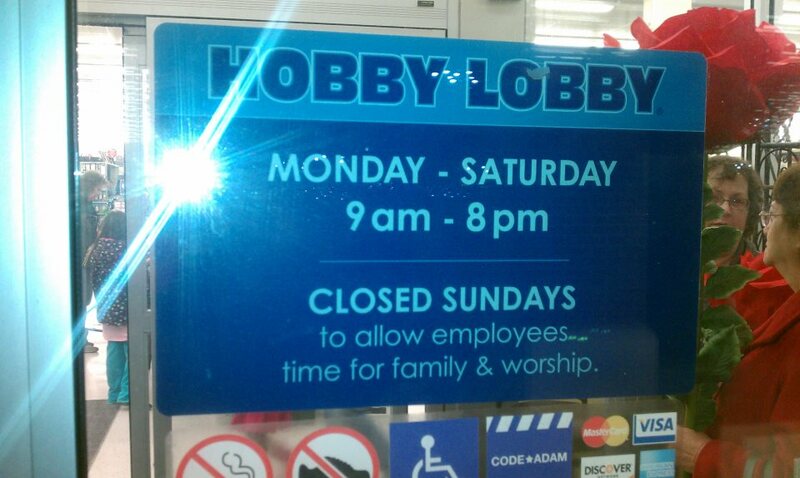 There are other groups fighting against this mandate, it’s just that Hobby Lobby is the largest. I am a Christian and I love to craft. I support their decision. We are still respecting the First Amendment right? Not all insurances pay for abortions or anything that “causes” an abortion, such as the morning after pill. So why make this company do it? I don’t think that’s fair. I spoke with some workers there tonight and they are not happy with what the government is doing. They are happy Hobby Lobby is fighting. I mean, $1.3 million in daily fines if he doesn’t pay for types of contraception. YIKES! It’s not like their employees are being mistreated. They are actually getting good insurance coverage and getting paid well. So, unless an employee had an issue with it, why did the government come after Hobby Lobby? This company refuses to pay for the morning after pill. They refuse to pay for “abortion-inducing drugs.” They are staying true to their faith. They will not be the first! Heck, my insurance doesn’t pay for it and I have GREAT insurance! Ok, so now we have Walmart, who is a Christian-based company and Hobby Lobby. I wonder are they going to go after Kraft’s Macaroni and Cheese next. He’s, James L. Kraft, was a Christian and his company was founded on Christian principles. Bottom line: We all have free will.